Tanisia hasn’t feel so good for over hundred years – young, fit, slender and hauntingly beautiful again. She deserved it. Lately things were rough for her – she couldn’t find the right host for a start and she felt her powers waning fast. She was becoming desperate and small wonder – every day she saw her withered, crinkled face and puffed up, horrible old body in a mirror she wanted to howl with rage. Depression was very bad for her, bad looks even worse. All because of some stupid words said in a wrong moment. Giving your lip to a warlock is never a good idea. However, Tanisia was a bit drunk at that time and the warlock in question behaved in an outrageous manner, pawing her in public, suggesting a price for her services, importunate jerk. She humiliated him in front of others and he never forgot. Soon enough she found out she has been seriously hexed. First her perfectly young host started to age very quickly, givning her bags under her eyes, headaches and bad breath in the morning. As if it wasn’t enough, people started to avoid her in the streets – as soon as she looked at them they kept turning their heads and passing to the other pavement, sometimes running in the opposite direction. How a decent witch is going to find a new prospective host if she can’t be socially acceptable? What’s the point of being a powerful, immortal being without enjoying such perks as great looks and seductive powers? She tried reconcilation, she really did, appologising and bringing gifts, grovelling and begging. The warlock turned everything down and laughed at her mercilessly. Then he kicked her down the stairs of his luxurious villa. From that time is was personal like hell. She started researching different hexes and plotting her revenge. Time was not on her side but the fact that she didn’t have either to sleep or to attend any social functions helped. After months of fruitless research punctuated by occassional fits of rage she found what she was looking for. The solution would cost her everything she had but it was doable. First she had to learn about the warlock’s ancestors and to find the right tomb. It took her three months to locate it, three really horrible months as nobody wanted to answer questions asked by a wizened old crone who couldn’t hold her urine anymore, stank to heavens and didn’t have one single tooth left. Tanisia had to use other agents which meant wasting time kidnapping people and then extricating the right info from them. Painfully time-consuming and boring process depriving her of her energies. Then she lured the warlock to the tomb by hiding her best treasures there. Luckily he was one greedy big-headed fool, unable to pass over such an occasion even if it might have been a trap. She knew her possessions would have been destroyed in the process but it was the required price. Finally the last bit – a proper new host had to be positioned in the tomb. She chose the warlock’s last paramour, a dark, delicate beauty from an aristocratic but impoverished family. Tanisia had drugged her and kept well-hidden behind a coffin. The spell hit them all like a flash of lightning. For a moment or two shell-shocked Tanisia wasn’t sure whether it worked or not but she had hidden a mirror nearby for that purpose. When she felt strong enough she glanced at her own reflection and smiled. The warlock was obviously dead, her wizened old body- pulverized to nothing along with the treasures she had brought with herself but she was young and hex -free again. 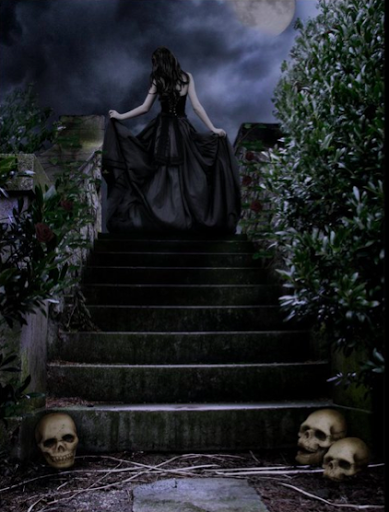 She started to laugh, swirling in extasy, spreading the folds of her midnight dark dress, dancing her way out of the tomb. She never noticed a small mole digging frantically with its paws and hiding in the ground. This entry was posted in friday flash fiction. Bookmark the permalink. Oh love the ending. I agree with Blodeuedd… very wicked indeed. Thanks Melissa, I am glad you found it so appropriate! You really do have a dark side! Most normal people do I suppose, like they cast a shadow in the evening. *blush* thanks! Uh-oh, I think someone is going to be in trouble later on. Nice story. Brooke the trouble is always close to the wicked in my stories! Thanks for a visit!Michelle the warlock definitely is a nasty type and the witch will be doing great…for some time at least!Hi Dottie! You are on something with the mole ;)Thanks for a visit! Oh that wizard got what he deserved! And should have got more. ;D lol. Great story. But now I'm worried about that mole there. Thank you!